Record-setting Jeopardy! 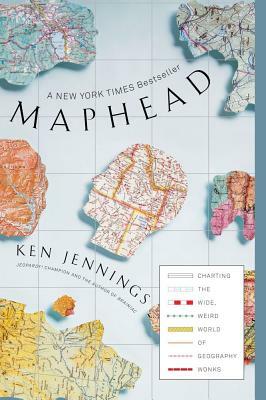 champion and New York Times bestselling author of Planet Funny Ken Jennings explores the world of maps and map obsessives, “a literary gem” (The Atlantic). Ken Jennings takes readers on a world tour of geogeeks from the London Map Fair to the bowels of the Library of Congress, from the prepubescent geniuses at the National Geographic Bee to the computer programmers at Google Earth. Each chapter delves into a different aspect of map culture: highpointing, geocaching, road atlas rallying, even the “unreal estate” charted on the maps of fiction and fantasy. Jennings also considers the ways in which cartography has shaped our history, suggesting that the impulse to make and read maps is as relevant today as it has ever been. From the “Here be dragons” parchment maps of the Age of Discovery to the spinning globes of grade school to the postmodern revolution of digital maps and GPS, Maphead is filled with intriguing details, engaging anecdotes, and enlightening analysis. If you’re an inveterate map lover yourself—or even if you’re among the cartographically clueless who can get lost in a supermarket—let Ken Jennings be your guide to the strange world of mapheads.